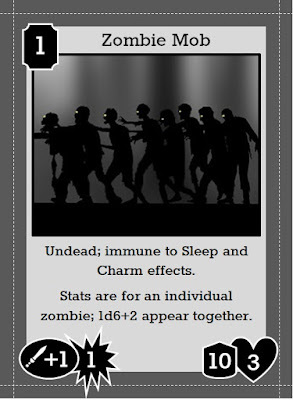 I'm not completely sold that this should be a Monster card as opposed to an Event that just has you put some Zombies into play; this one may switch soon. And with that...wow...we complete the alphabet and the challenge! A very big "thank you" to anyone and everyone who has stopped by this month. I hope you've gotten at least some mild entertainment...and if you've happened to enjoy it, please stay tuned, as I think I'll be following up on this project quite a bit in the coming weeks...! (Oh! And please let me take this chance to point out one blog that I failed to highlight with a "tribute card" this month, but that I'll hopefully target as I expand the game a bit more. Celia over at WordWacker had a very simple but cool theme for the month...a geeky haiku riddle for each letter. WordWacker is another blog that I discovered through the A to Z this year, and I've enjoyed stopping by to check out the riddles. I think I like the mob as an event, but also having zombie as a card. I might just end up having my cake and eating it too with the card by keeping it somewhat like this and making a bunch of zombie cards ("Brainseekers" or something) to go along with it.